First floor 4,375 sq. ft.
Second floor 6,482 sq. ft. In spite of delay-after-delay for the startup of Operation Safehouse of the Desert Phase II project (awarded in February of 2012) construction began October 2012. Orr Builders achieved the drop dead date of 7/3/13 to assure Safehouse project received the additional HUD funds tied into this finish date. 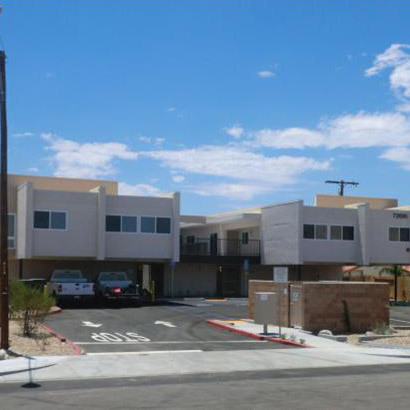 This two story 16 unit apartment complex backs up to the Operation Safehouse of the Desert Administration and Housing building Orr builders built and completed in 2007. All downstairs units are completely A.D.A. compliant and the remaining units upstairs fit in with the same finishes. Common area space both downstairs and upstairs allows tenants to congregate in an environment secured by keyed admission to the complex and fully fenced and gated form all sides. The on-site parking lot for tenants that have vehicles and access to the administration building at the rear yard also has keyed passage.